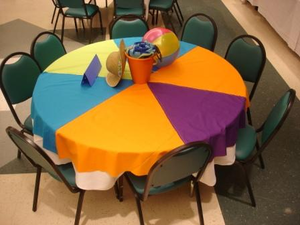 School auction themes vary dramatically, but here’s one called “Beach Ball.” The overall effect was more beach than ball. When spring break isn’t quite here and winter has been around for eternity, everyone is eager to relive some of the summer warmth enjoyed so many weeks before. Here are some elements which stood out. 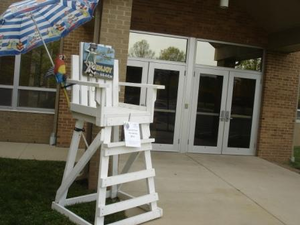 I loved how they found a lifeguard chair and put it outside the school. 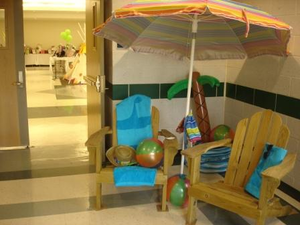 I asked one of the school auction co-chairs where on earth they’d found a lifeguard chair. Upon entering through the glass doors, guests saw another display. This one was of Adirondack chairs with a palm tree. Carrying a theme through from beginning to end makes it special, so the earlier you can introduce the theme, the better. By the time our guests reached the registration table, they’d seen two decor elements and now — at check-in — they are greeted by lifeguards. I like how the uniforms make it easy for guests to identify someone who can help them. It’s easier to see a red shirt with a lifeguard cross on it than it is to, say, see a namebadge. The colorful signage scattered throughout the venue was cut into the shape of surfboards. 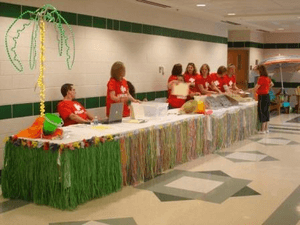 This is a simple idea to incorporate into your school auction. All you need to do is decide upon an appropriate shape for your theme. Unfortunately Stacie, but I wasn’t involved in that element so I can’t point you to the direct source. That said, most decor items in our school auctions are picked up inexpensively throughout the year from discount vendors online (try Oriental Trading) or in brick-and-mortar stores (try Tuesday Morning or Super Dollar). Good luck! Hi Sherry: Congratulations on having such a creative event for such a good cause! I was hoping that in the intervening months since Stacie wrote asking about the beach ball tablecloths, you might have ran into whomever purchased them and could share the identity of the store or site. I look forward to your reply and thanks again for sharing what you did! Thanks for posting, Eileen! No, I don’t have an update. This auction was held around 2007 — about three years prior to my blog post on it. It’s unlikely I would have ever seen those same volunteers again. Plus, I tend to work with the Auction Chairs, not the decor committee. This type of detail isn’t something that often enters into our conversation as it isn’t a critical auction component to drive profitability. I encourage you to search Google and see what you find online. And of course, sometimes items like these are uncovered in someone’s basement or attic where they were used at birthday parties. Check with your committee — you might be surprised at what they turn up! Hey! We are in charge of our school auction, which will take place in an old cannery building with windows overlooking the city. We wanted to incorporate wine and wildflowers / flowers into the theme. Any ideas? If you poke around the blog, you’ll find ideas that you can use or at least something that will inspire you. It’s easy to search the blog archives for categories like decor, centerpieces, and themes.